When I opened today's edition of the Economic Times, one headline made me sit up and take notice: 'Tata Steel puts entire UK business up for sale'. That's a big one. What happened? It was well known that Tata Steel's European operations were under the weather for quite some time. But was it so bad that the business could not come out of it? Certainly looks like it. But it got me thinking about a much bigger issue - the perils of big acquisitions and the difficulty of integrating them. Let's rewind to 2006-2007, just before the global financial crisis. There was a general sense of optimism in the global economy, which was mirrored in the stock markets. This was when a lot of Indian companies - not just the Tata Group - harboured ambitions of becoming multinationals and establishing a strong international footprint. So you had Hindalco acquiring Novelis, Dr Reddy's going in for Betapharm in Germany, and of course many Tata Group companies going on an acquisition spree. Besides Tata Steel acquiring Corus for a massive US$12.1 billion, you had Tata Motors acquiring Jaguar Land Rover (JLR) for US$2.3 billion. When you make a big international acquisition, you really only need to consider two factors: the price you pay for the acquisition target (plus the funding) and the geographical risk of the acquisition. More often than not, managements end up paying a very high price as the bidding war heats up. This becomes a problem because it takes years for the acquisition to break even...if it breaks even at all, and then a spate of write-downs follow. Specifically, if the target is a big one, then you are compelled to take on more debt on the books. All of this only piles the pressure on the acquirer's business. Geographical risk is always a problem because you never know whether there will be a change in government regulations or when an economic downcycle will start. Dr Reddy's acquisition of Betapharm in Germany turned out to be a damp squib as certain regulations in Germany changed and the company had to undertake a slew of write-offs. Tata Steel has been bogged down by commodity crash and a general downturn in the UK. It's not that this development seriously questions the management capability of Tata Steel. It's just that if the economics of the business are bad, there's not much even a good management team can do to turn it around. That's why it's critically important for companies to strike the right balance between the business fundamentals of the acquisition target and how much they're willing to pay for it. In a recent edition of the ValuePro Contenders, I talked about how some Tata Group companies deserve to be part of the ValuePro portfolios while others need to get a few things in order before we seriously consider adding them. What do you think is our verdict on Tata Steel? Click here to find out. Do you think that big international acquisitions add much value to the acquiring companies? Let us know your comments or share your views in the Equitymaster Club. The power sector is going through troubled times. The State Electricity Boards (SEBs) that buy power from generators are reeling under huge losses and bloated debt. As a result, they have not been entering into power purchase agreements. Therefore, the capacity utilisation level or the plant load factor (PLF) of generating companies has been on a steady decline over the years. 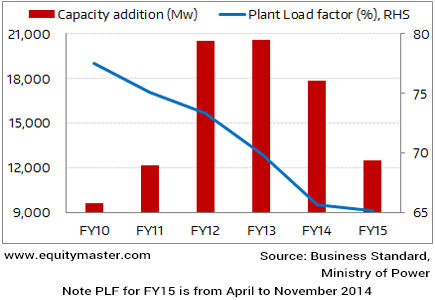 As per the annual report from the Ministry of Power, the PLF has fallen from a peak of 78.6% in FY08 to about 65% upto November 2014. Saddled with unused capacities that have hit earnings, power producers have been slow in adding new capacities. In fact, the capacity additions in the power sector have fallen by 39% in the last two years. The government program 'Ujwal Discom Assurance Yojana' (UDAY) for SEBs holds hope to revitalise the power sector. This is because unlike the previous bail-out packages that were provided for debt restructuring, the UDAY offers a framework for the long-term revamp of SEB operations. Under UDAY, states will have to take over 75% of the SEBs' debt over a period of two years against which bonds can be issued. The acquired debt will have interest rates restructured at around 8-9% (14-15% earlier) and will not be considered in the state's fiscal deficit until FY17. The respective states will have to bear any losses incurred by them from FY18 onwards. And they will do so in phases, starting with 5% of annual loss in FY18 that will gradually rise to 50% of yearly loss by the year 2020-21. By making losses a part of the fiscal deficit target, states are expected to be more proactive in turning around the loss-making SEBs through measures such as quarterly fuel adjustment and annual hike in power tariffs. The UDAY scheme also provides for the reduction of SEB fuel costs through coal swapping. Seventeen states have agreed to join the UDAY scheme out of which six have signed agreements so far. While capital investment in the power sector is in the doldrums, the e-commerce companies operating in India have been huge generators of foreign investments of late. Therefore, recognising their importance, the government has finally decided to accord them legal status by allowing 100% foreign direct investment in online retail of goods and services under the 'marketplace model'. Under the model, e-commerce companies can provide support services to sellers such as warehousing, logistics, order servicing and payment collection. However, e-commerce companies having inventory based models have been kept outside the ambit of 100% FDI. In order to provide a level playing field to the brick-and-mortar retail stores, the government has also put a cap on the discount frenzy of e-commerce companies. As per the new rules, the total sales from a group company or a single vendor for e-commerce companies has been limited to 25%. The new guidelines play an important role in charting the growth and bringing some sanity in the cut-throat business operations of the e-commerce industry. Indian markets traded firmly in the positive in today's trading session on the back of sustained buying activity across index heavyweights. At the time of writing, BSE Sensex was trading higher by around 340 points. Buying was largely seen in banking, metals, and oil & gas stocks. The BSE Midcap and BSE Smallcap also did well and notched gains of 1% each. Rubber Prices Rise, Time to Exit Tyre Stocks? What should you make of the rising natural rubber prices that are likely to squeeze tyre companies' margins? Equitymaster requests your view! Post a comment on "The Perils of Big Acquisitions Spare No One...Not Even the Tatas". Click here! 2 Responses to "The Perils of Big Acquisitions Spare No One...Not Even the Tatas"
Your advice to & comments on Tata Steel are wholly gratuitous. I don't expect Equity Master to take the usual media line of wisdom after the event. You would have been entitled to your views had you expressed your reservations at the time of acquisition. Could you have forecast this severe a downturn in commodity businesses? Tata steel acquisition of Corus was a grave blunder ,both for the price paid and the assumptions of synergy presumed. It requires great courage an wisdom to exit a bad decision; this was absent and the loyal shareholders who account for 73% of the holdings lost their wealth;Tatas the priceless jewel , the trust of millions of shareholders.